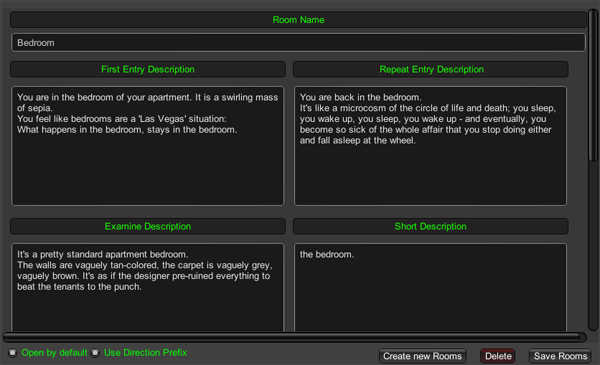 For an overview of the Room and its place in Tidy Text Adventures, see the Overview page. Not visible in the game - for your records only. The description printed upon first entry into the room. Example: You step into the Living Room. The memory of a thousand sitcoms floods into your mind. None of them gave you anything more than a passing thrill. The description printed upon subsequent entry into the room. Example: You are back in the Living Room. Your life is a circle. The description printed when the player examines the room. Triggered by either "Look" or "Look at [Room]" when the player is in the room. Example: "It is a basic living room. Grey, not dusty - but definitely ... something." The description printed when the directional exit summary is printed. The form that this should take varies with the setting of "Use Direction Prefix"
Example using Prefix: To the North is the living room. Example not using Prefix: The living room is to the North. The names that the player can use to refer to this room. The description printed when the player look at the room while standing adjacent / above / below it. Example: Above you you see the living room. It beckons you as if to say: "You needn't work so hard - melt into my commercial tendrils". A list of all items in the world item listing. Selecting one of these items will add it to the Room. The items that you have added to the Room. Selecting one of these items will remove it from the Room. Is this room able to be entered / seen by default? If this is false, this room will have to be unlocked via Action during gameplay. 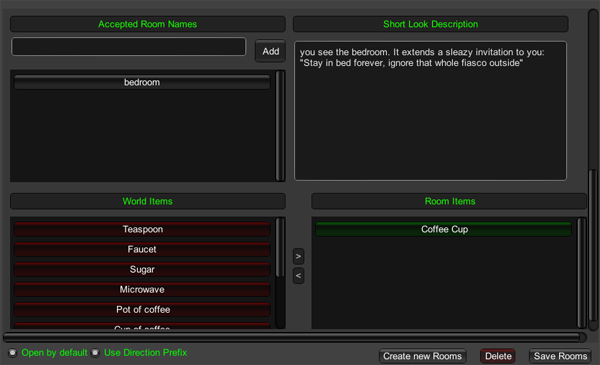 Will the direction prefix be used when displaying this Room as an exit when the player is adjacent to it?